have many backpacks & hydration to choose from. The GI Spec CFP-90 Day Pack from Tru-Spec is a comfortable all-purpose pack perfect for tactical missions, day hikes, urban exploration and more. The pack is constructed from ultra-tough 1000 denier nylon whose tight knit weave resists tears and repels water. Large cover flaps are secured with heavy-duty buckles and ensure that the pack stays closed and free of water and debris. Two oversized compartments offer ample storage space and can be stuffed full of clothes, shoes, flashlights and all other equipment needed for an outing. 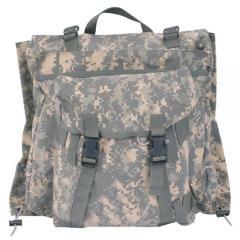 Fully adjustable shoulder straps feature high-density foam cores for comfortable long distance carry that will not dig into shoulders or place unnecessary stress on the back.